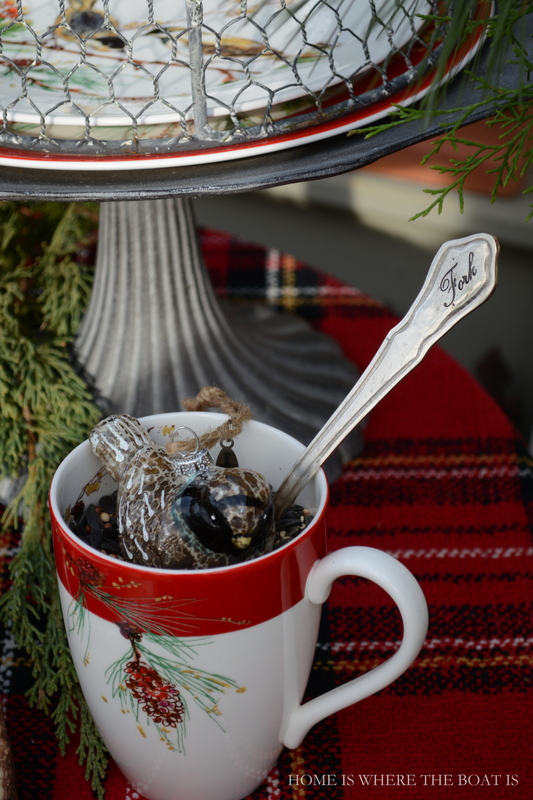 I’m picnicking with the birds with inspiration and fun provided by my Birds of a Feather Advent Calendar. 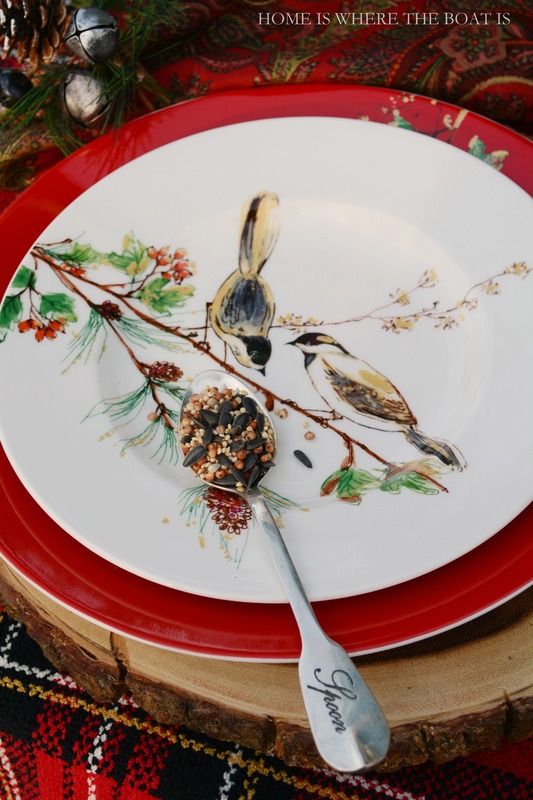 Birds of a feather have flocked together and Lenox Winter Song plates and mugs are joining the fun, set on a tree slice charger and plaid throw for a tablecloth. 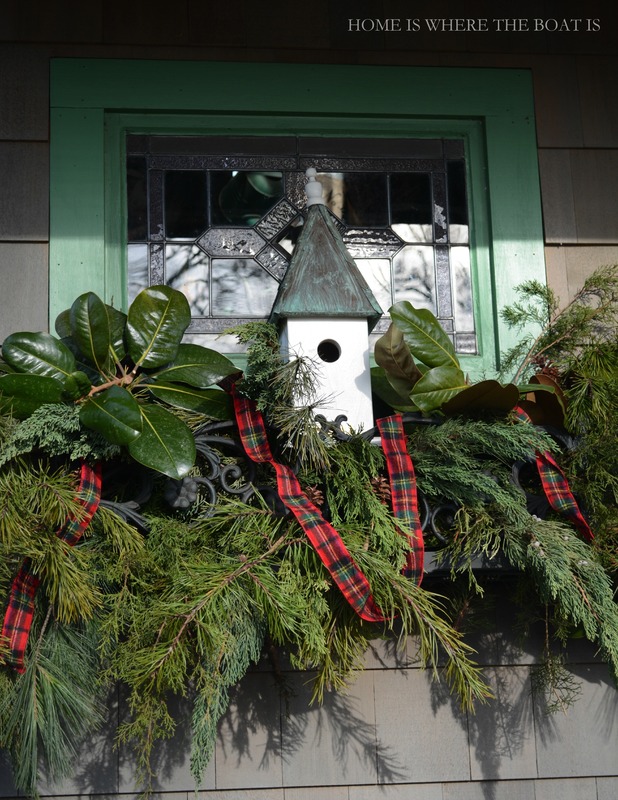 A birdhouse is perched in the window box of my Potting Shed, along with magnolia, cedar, spruce, and pine and a tartan ribbon for a little color. Birds are nesting in mugs. 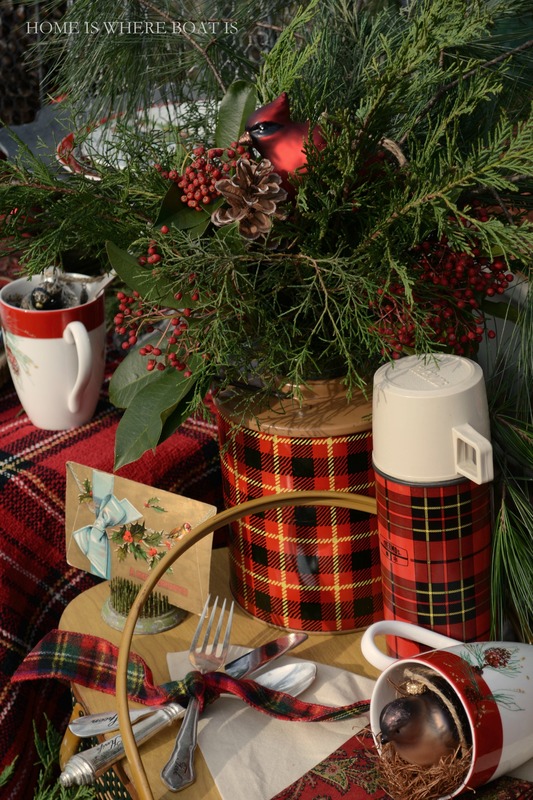 . .
And in a vintage red plaid Skotch Jug is serving as a vase for assorted evergreens, red berries. 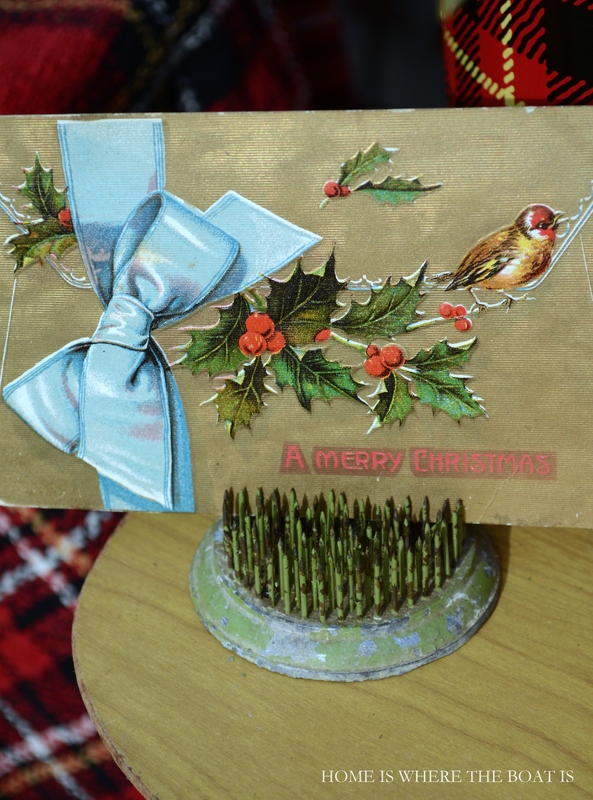 And a bird has flown in, delivering a vintage postcard with Merry Christmas wishes! A Gingerbread House turned Bird Feeder is providing a buffet of seed, peanut butter, raisins and cereal for this picnic. 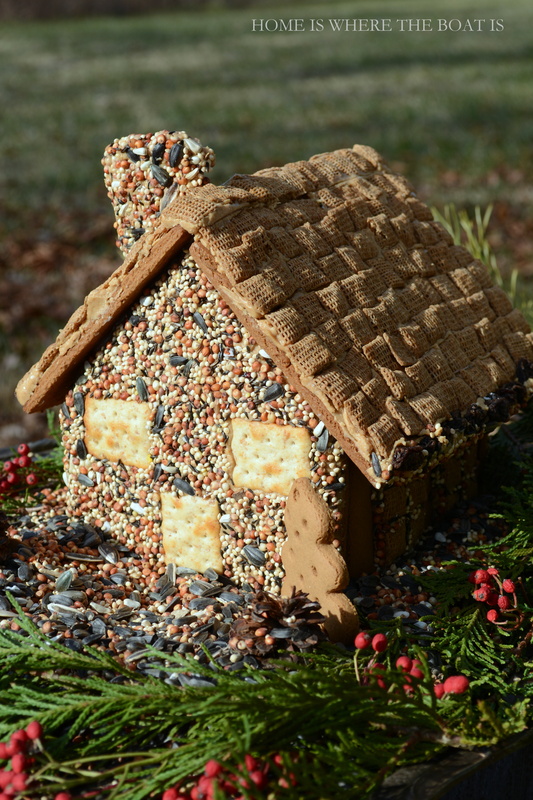 You can find a tutorial on how to build a Gingerbread House Bird Feeder, here. 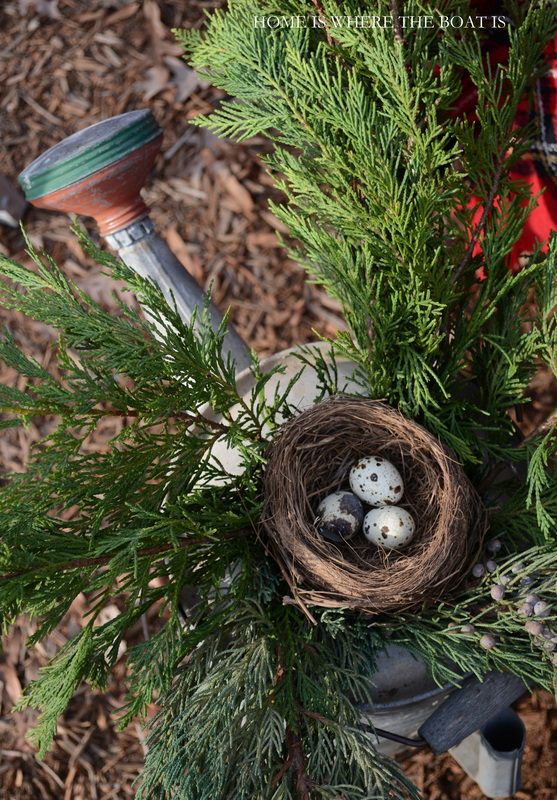 Wishing you Happy & Cozy Nesting this Christmas Season! Mary, The creativity just oozes out of you! I love every vignette you put together. Thank you so much for all the inspiration. I am truly enjoying your blog and wait with excitement for a new post. A feast for the eyes as well as the birds! Thank you, Mary, for the inspiration and eye-candy. I love every single post you make. 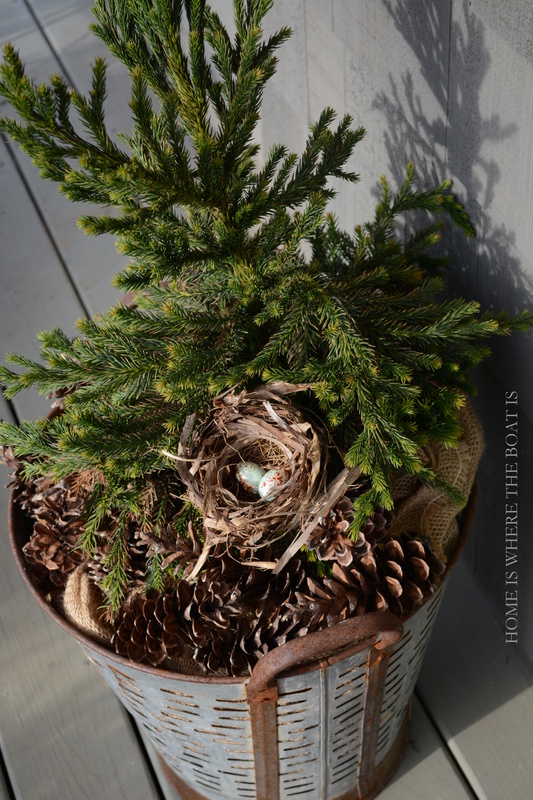 This post has given me a great way to decorate my window boxes for the winter, i.e., greenery and bird houses with bird seed and other decorations. Happy Holidays to you and your family. Your blog is simply the BEST. LOVE IT everyday. Thank you so much. Your picnic with the birds is a feast for all of our eyes, Mary. 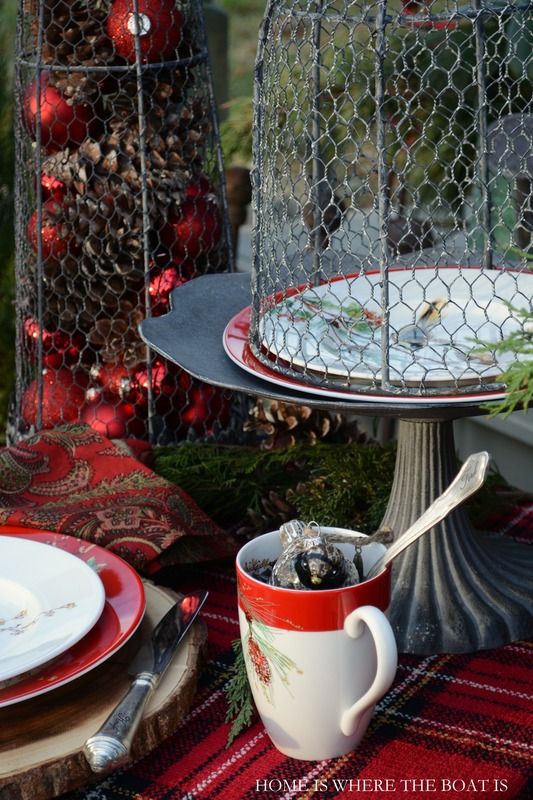 I love those Lenox plates and all your pretty plaid with the Christmas greenery. 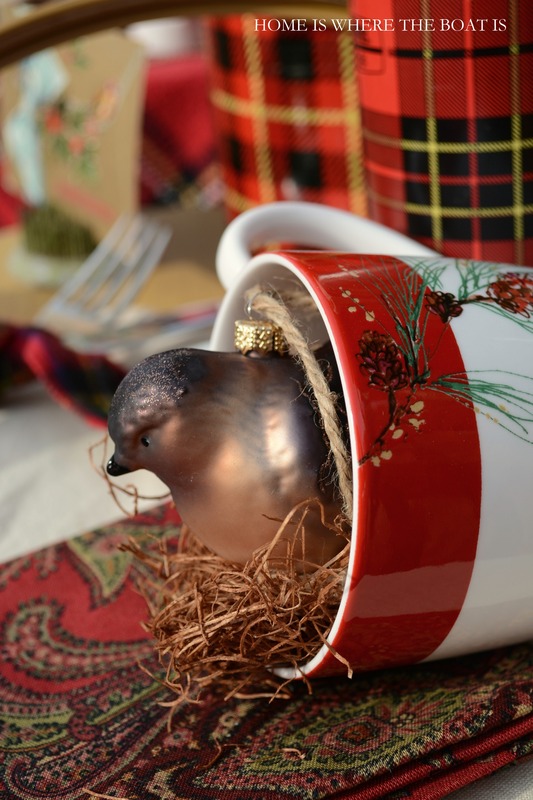 Oh Mary, that little bird nesting in the mug is the sweetest thing!! The whole scene feels so warm and cozy, happy and merry! 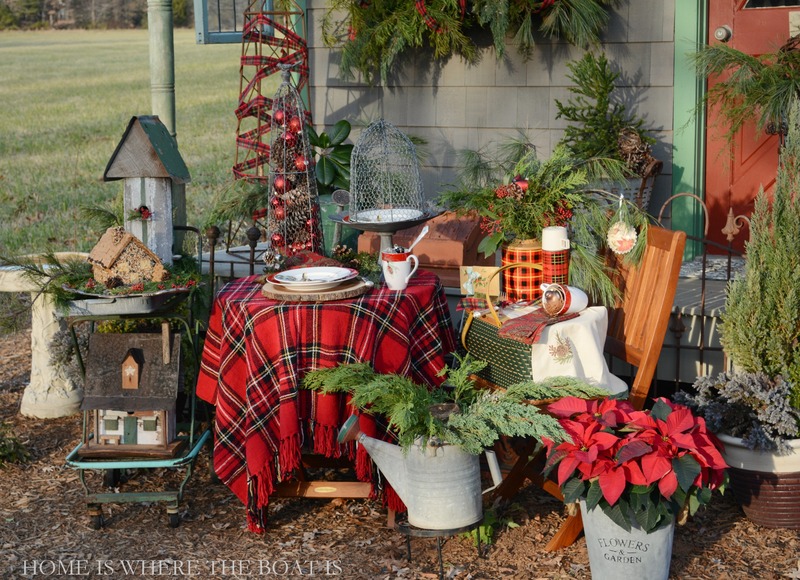 I still can’t wait to see the birds nibbling away at their adorable gingerbread house :) The greens in the plaid cooler and the way you’ve woven touches of plaid and red throughout are just wonderful~ Love the pinecones and ornaments under the chicken wire cloche…a storybook scene! Have a Merry Jolly weekend! What a delightful picnic setting! You are so creative and I always love your blog posts. 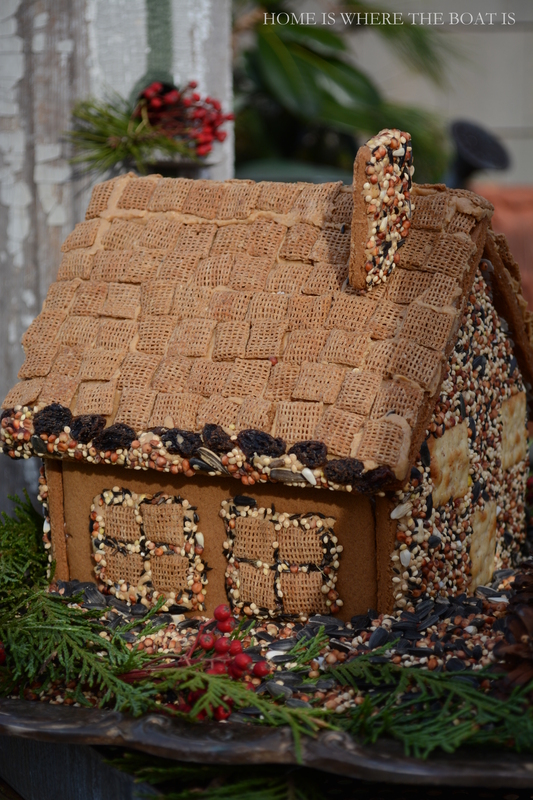 My favorite decoration is the birdseed gingerbread house. Have a Merry Christmas! I need those dishes. Wait. No, don’t need…WANT those dishes! Really really want those dishes. You know you are entirely to blame for a lot of my dishware obsession. My girlfriends have tried to do an intervention on me, but I just sneak around em and surprise them with more. I’m thinking they just might be treated to a lil “bird plate” luncheon after first of yr!!!!! How creative!!! 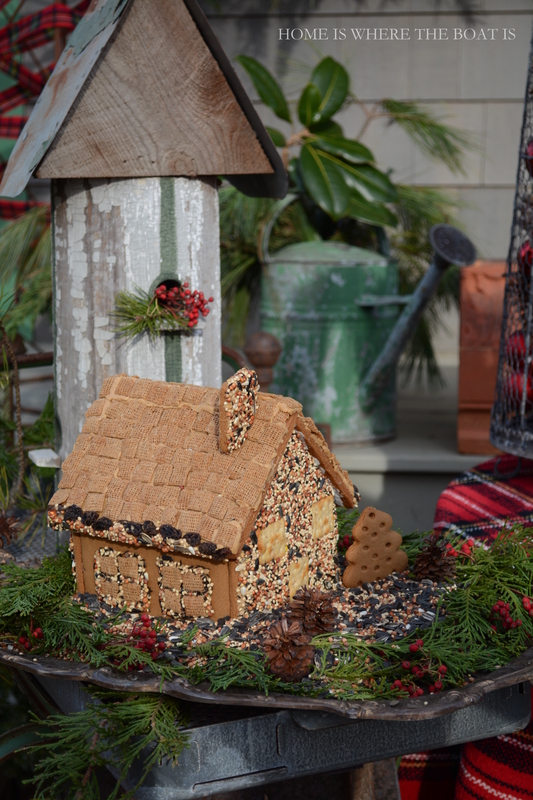 I never would have thought to make a Gingerbread BIRD FEEDER House!!! Just darling! I’ve got the makings for a candy coated one but I bet Ms. C. would enjoy covering it with seeds for the birds more. Good January project to do with her! I Totally love those Lenox Winter Song plates…I didn’t know they even made those!! Beautiful. I could kick my DD for pitching a plaid picnic basket..or was it a lunch pail? Whatever, she tossed it out. Silly kid…doesn’t she know we NEED such items for tablescapes??? You must have an entire staff of elves, helping you to drag out & set up all this stuff, Mary. Or else, you’re hyperthyroid & have tons of energy. LOL Well done, as always. “Tweet, Tweet!”, say the lakeside birdies. I want to sprout wings and fly in for the picnic. Your abundant energy and creative are truly amazing. How do you do it all? Opening a post from Home Is Where The Boat Is is like unwrapping a beautifully wrapped package filled with layers and layers of treasures. 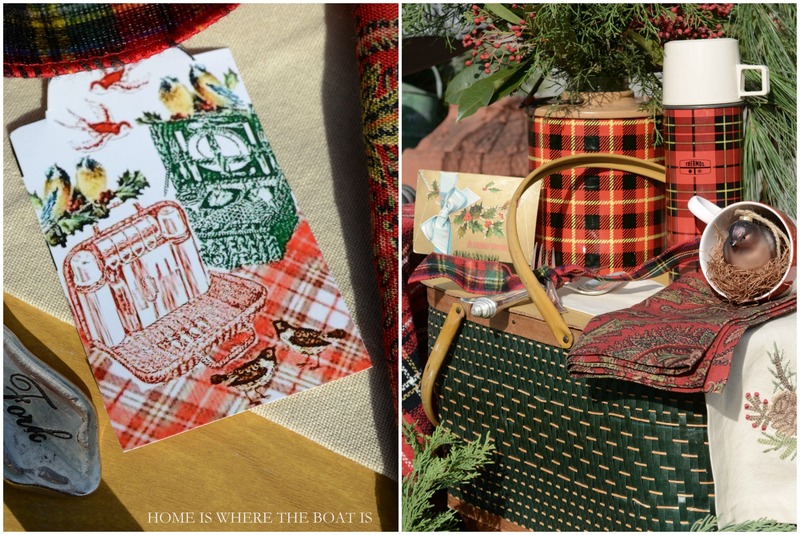 Needless to say this tartan, bird loving Texan is going to pin these images for my own future inspiration if and when I find the energy to have a picnic with the birds. 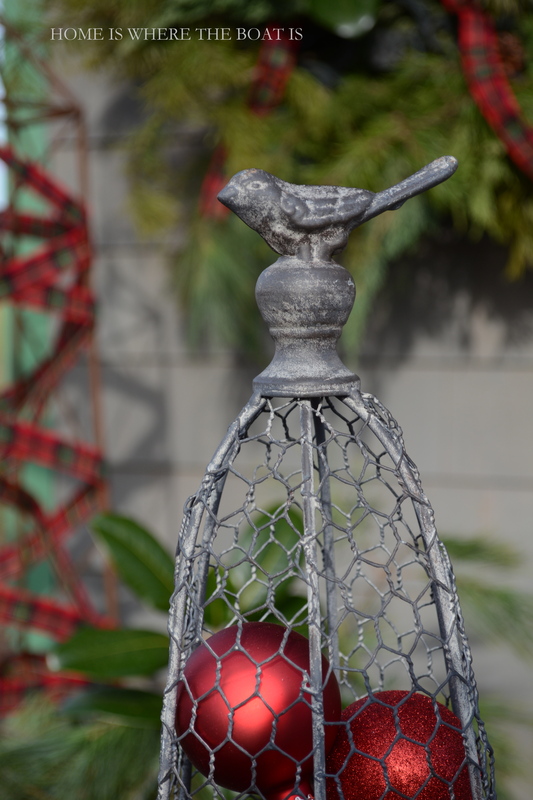 Love the Lenox Bird Song dishes! I enjoyed dinner last night at a lovely table set with Lenox Bird Song. Such a pretty pattern! Just when I think you just can’t come up with another angle in your creativity ….you do! A picnic for the birds in front of the Potting Shed would be just the perfect thing for utter contentment…. 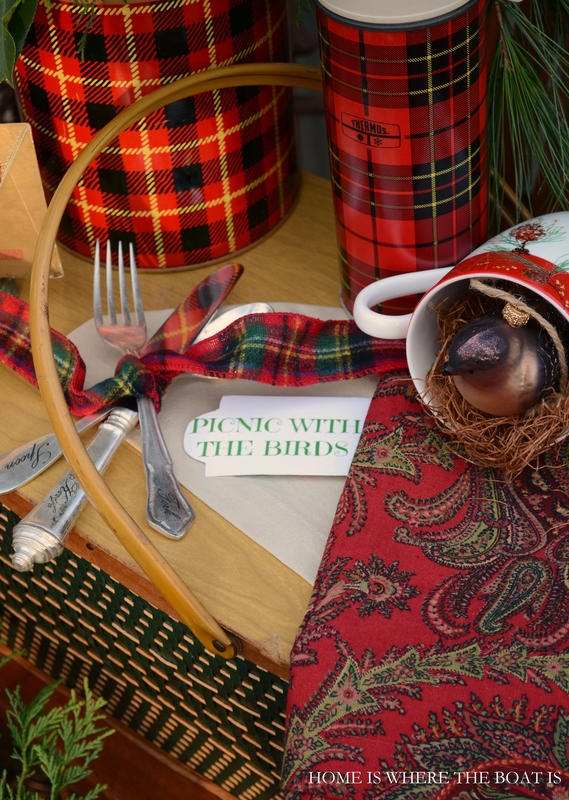 Every bird in the neighborhood will be vying for a reservation at your picnic. What a terrific job…I love the bird feeder. My little birdies are all so jealous now! 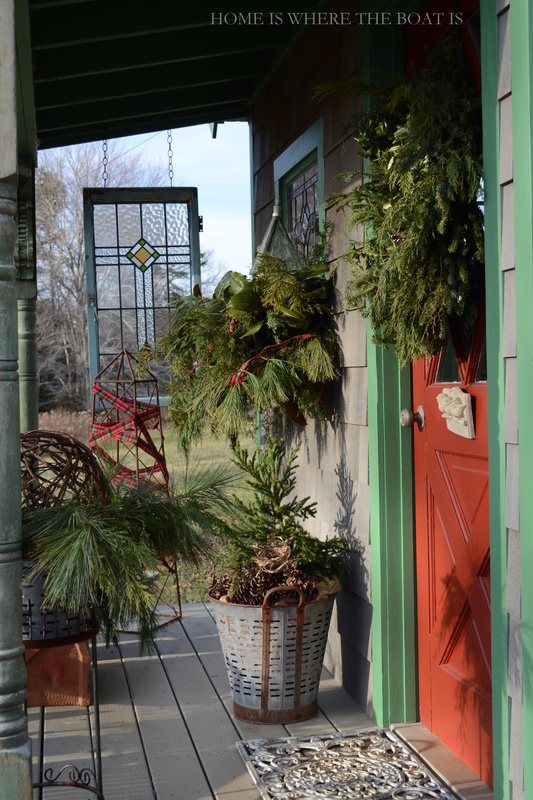 I don’t have an adorable potting shed, but I got to thinking that I could still do something like this on the deck…why not have eye candy while watching the birds enjoy their treats, right? All the other posts—so true. You really have the talent, lady, and I’m one of the lucky recipients of those amazing ideas. Thank you for all the time and energy involved. I know I speak for everyone when I say “you are a gift”. 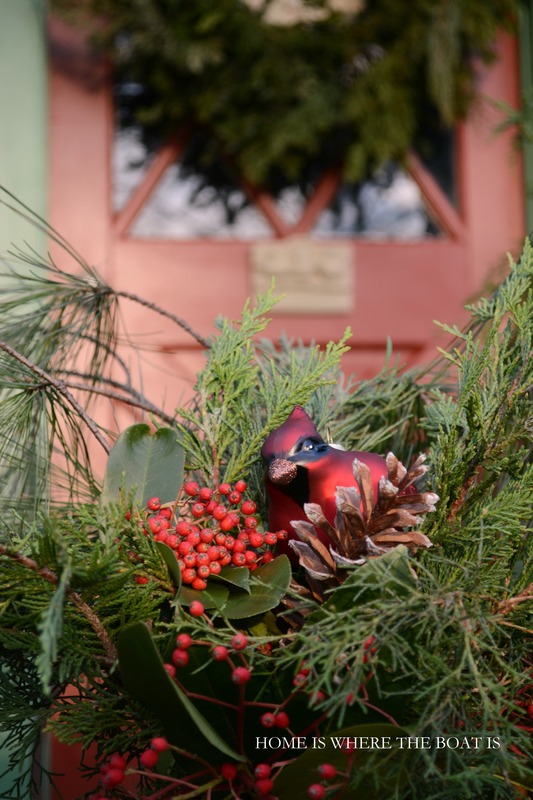 Wishing you and yours a joyful and blessed holiday! Oh my gosh Mary! This post is a feast for humans as well as our bird friends! 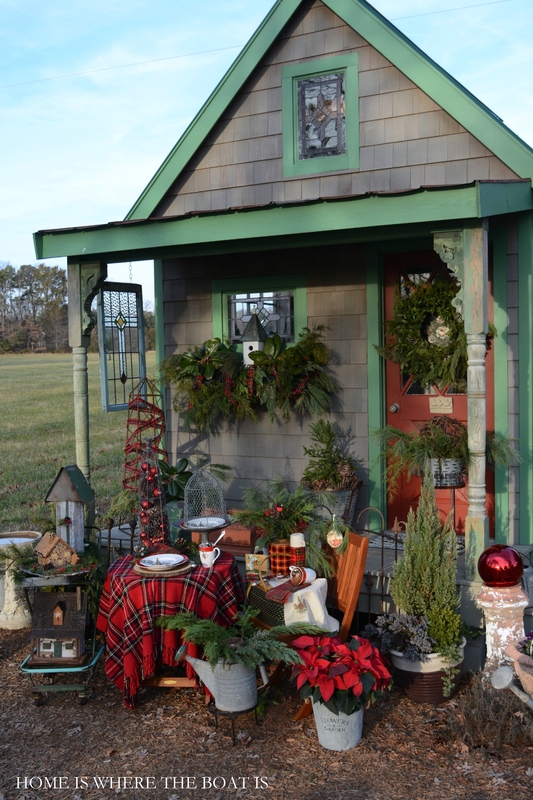 It’s all so beautiful, and I hope to find time to make that cute gingerbread house. Merry Christmas to you and yours! Thanks for sharing your creativity with us, Mary, and I hope you have a great weekend! Your bird posts, and your fairy posts are my absolute favorites. I never get over how very talented you are, Mary. Thank you for the sheer delight your posts provide! 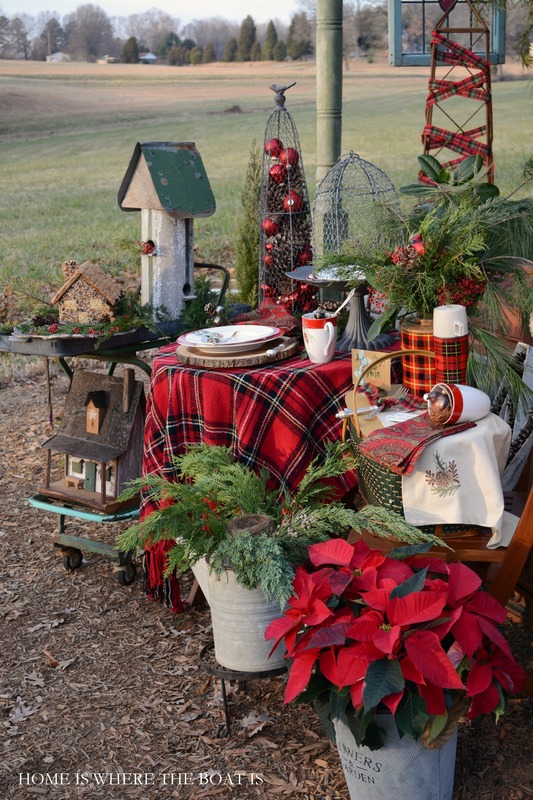 I wish I could do something like this outdoors but it is SO darn coldout there, plus we brought the table and chairs in:( Maybe next year I will do something like this in the Fall and take the pics for a winter post! You are SUCH an inspiration, your blog is like a FABULOUS book. You really should write a book!!! Each post is a feast for the eyes, truly. Merry, merry!!! Well done Mary!! Thanks for another inspiring blog -.can’t wait to try one. Tomorrow I plan on making the bird treats out of the cookie cutter molds. 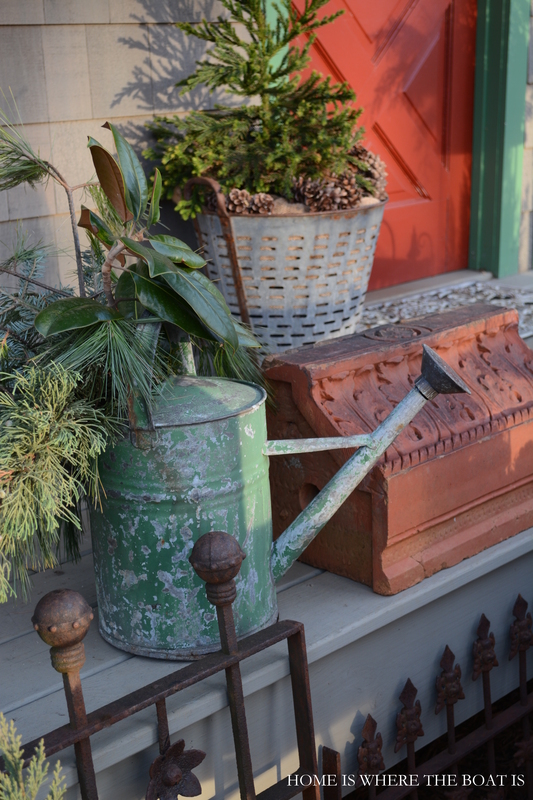 We love the potting shed, birds, and YOU! God bless and Merry CHRISTmas! I love everything in this picnic! What a beautiful setting and the photography is amazing! The little bird treat house is adorable! Love your bird feeder and I’m sure the bids love it, too! So thoughtful. I always enjoy visiting with you! Thanks for the inspiration all year through. Merry Christmas!